I am a gardener at a community P-Patch garden in Seattle, Washington. I also volunteer/write for the P-Patch Post, which is a free bi-yearly newspaper that is mailed to each gardener in the P-Patch program. I wrote the below article, which appeared in the Spring 2016 issue of the P-Patch Post. 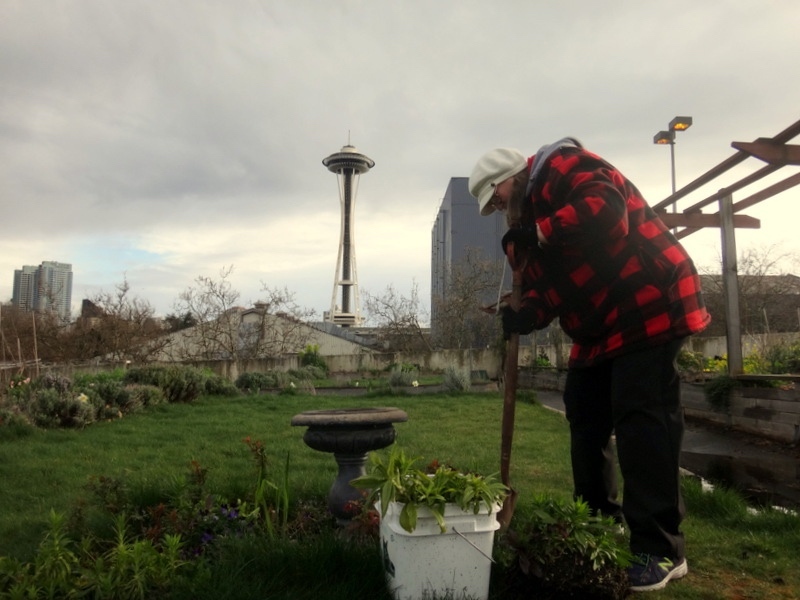 Her name is Bonnie Hedman, but she’s better known as the ‘Gardening Grandma.’ If you’ve ever visited or spent any amount of time at the UpGarden, the P-Patch community garden that sits atop the Seattle Center parking garage, you’ve probably seen her working in the common beds, or leading a children’s group through the ‘touch and smell’ garden, or helping a new gardener get trained on how things work. She’s the driving force behind the garden’s partnership with the Center School, the alternative high school located at the Seattle Center, which has its own student plot in the garden. She also manages the garden’s partnership with the nearby Brookdale Senior Living home, which grows the starts each year for the garden’s Giving Garden and the Children’s Garden. And she’s responsible for creating the ‘touch and smell’ garden, which allows visually challenged students to experience the garden in a way they couldn’t before. Each year, P-Patch gardeners are required to put in 8 community service hours as part of the agreement to keep their plot. Last year, Bonnie logged 370 volunteer hours. Bonnie took over leadership of the garden about a year ago, but she’s been involved in the garden since the planning stages. Despite having a physical disability that prevented her from helping with the labor, Bonnie even took part in the construction of the garden back in 2012. The original plans for the garden included a Children’s Garden, so Bonnie took it upon herself to reach out to local schools, which led her to the Young Children Academy, a local preschool. That connection led her to the Seattle Public School district, which was looking for a place to take the district’s visually impaired students. 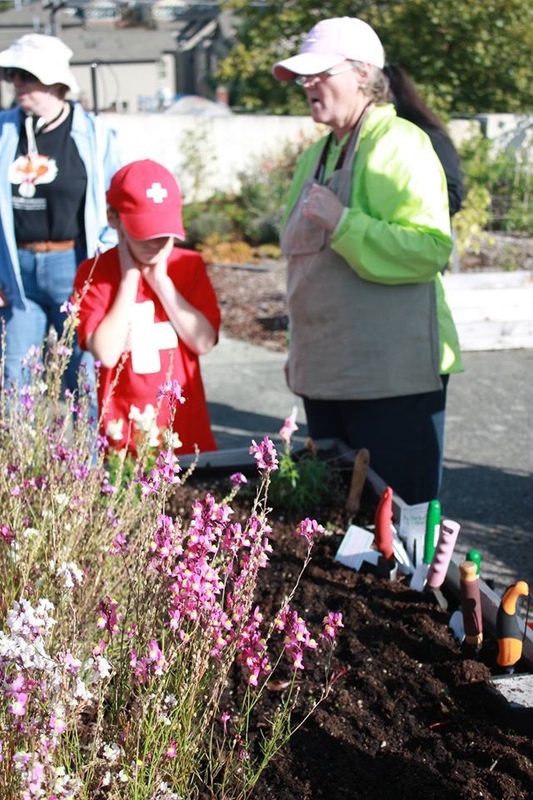 During a day camp, they developed the ‘touch and smell’ garden, which includes plants such as pineapple sage, which smells like its namesake, and yarrow, which feels like a feather. Looking for a way to get more people from the Seattle Center involved, Bonnie submitted a proposal to the Pacific Science Center to bring kids from the summer day camps up to the garden, which they’ve now been doing for three years. The Children’s Museum came on board last summer. The Seattle Center partnership led to a relationship with the Center School, an alternative high school located at the Seattle Center. Students from two science classes now come up to tend to their plot at the garden. In addition to all the educational outreach, Bonnie also manages the garden’s partnership with the Brookdale Senior Living home, located a couple blocks from the garden. 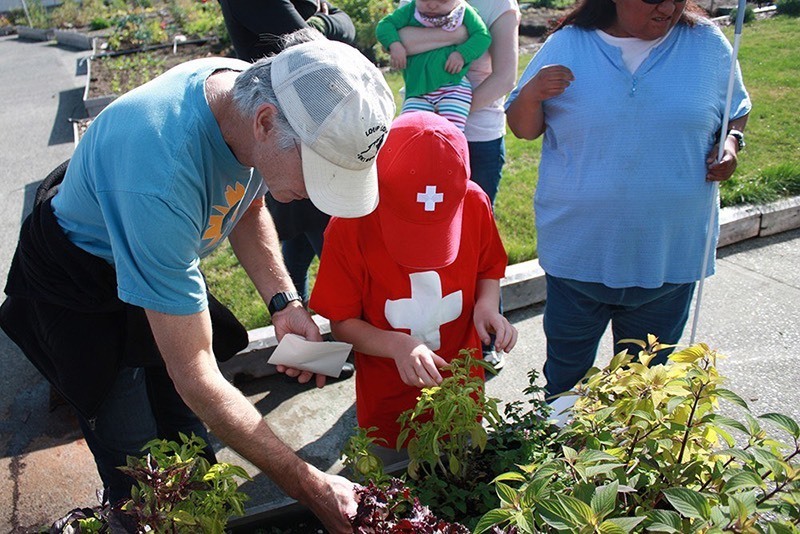 Originally, another UpGarden gardener approached the senior home as part of a class assignment on community involvement, and the residents got involved by growing the starts used in the Giving Garden. That evolved into two women who now grow all the starts for both the Giving Garden and the Children’s Garden. Bonnie has been gardening for 40 years. She was an Army brat growing up and moved around a lot—but she remembers her family always growing food, no matter where they lived. As an adult, she lived in Montana with her two children, and home-grown food was an important part of their diet. 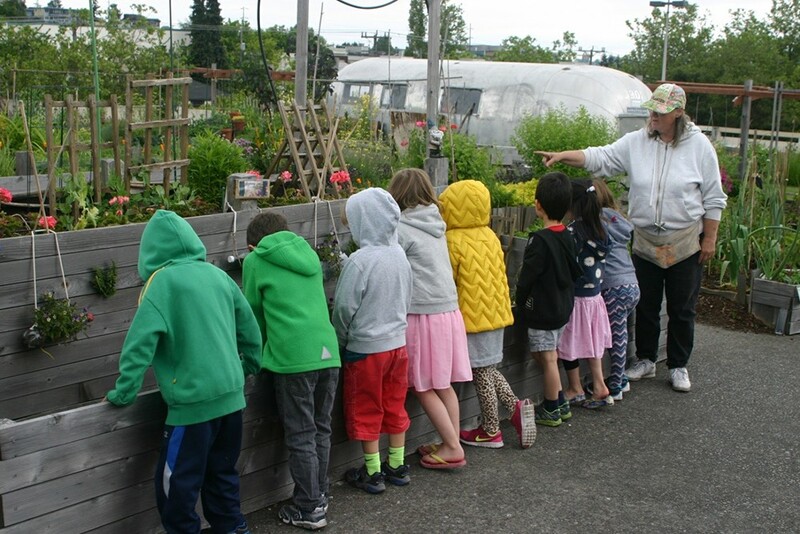 She’s been gardening ever since moving to Seattle with her kids in 1976, whether it was a flower pot on an apartment patio or a shared garden at the Interbay P-Patch. She even managed to garden while living on a sailboat in Shilshole Marine for 7 years. So why does someone volunteer 370 hours of their time to a community garden? One reason is that it can be tough to build a network of friends in a large city such as Seattle. “I need people. And up there, we’re all gardeners. My community is so enlarged by the UpGarden,” Bonnie said. One of the biggest benefit she gets from spending so much time at the garden is her physical well-being. “Physically, I’ve lost 40 pounds from walking back and forth from my apartment to the garden. And my bone density has also gone up almost 9%,” Bonnie said. But more importantly, her mental well-being is also vastly improved. But despite all the benefits, Bonnie does concede she does have her limits when it comes to how much she can do. But anyone who knows her knows that disability doesn’t stop her from getting up to the garden nearly every day, rain or shine. 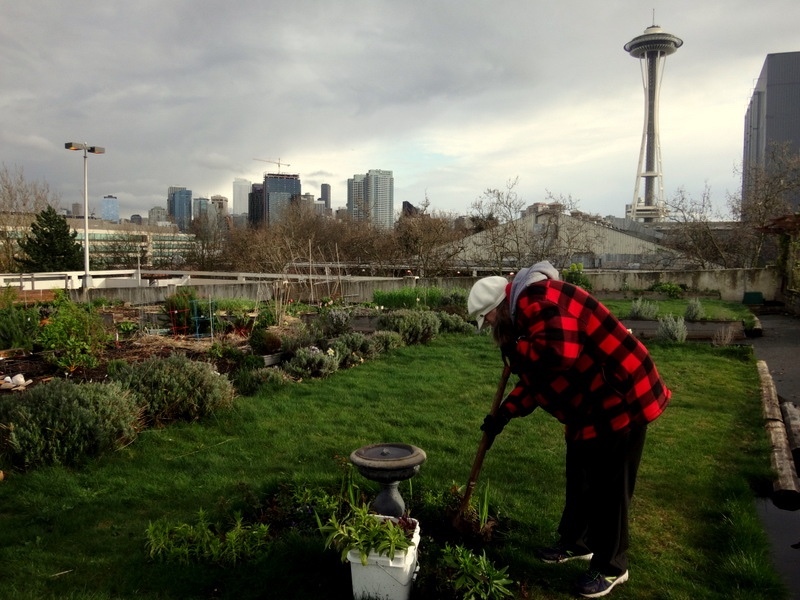 She’s also become involved in the UpTown Alliance, a community development organization that is supportive of keeping the garden in the neighborhood when the Seattle Center parking garage comes down (those plans were always in the works, even before the garden was built). Bonnie logged 370 hours of volunteer in time in 2015, but she expects she’ll log as many, if not more, in 2016, but she wouldn’t have it any other way.